The Smart Home concept continues to gain popularity with more and more people adopting the technology by purchasing devices like the Amazon Echo and Google Home, and pairing them with other smart devices like light bulbs and refrigerators in their homes. When it comes to smart lighting, one of the first things people think of is the ability to control the lights and atmosphere of any room in the house with a few simple voice commands or with the help of an app. That is definitely one of the highlights of smart lighting. Smart lighting has other benefits as well beyond the aesthetics and convenience, which we shall explore further now. Our brain helps to regulate our sleep cycle by releasing a hormone called melatonin, in response to lower light. Melatonin levels start to increase in the evening and peak at night, before dropping in the morning, when it's time to wake up. Probably the biggest issue when it comes to melatonin production is the exposure to bright light in the evening, which disrupts the body's natural melatonin production. This is where smart lighting can come in really handy. You can programme your smart lights to automatically dim or switch to a warm color, half an hour before bedtime. The reduction in brightness signals to your body that it is time for some quality sleep. In the morning, you can do the opposite, by programming them to progressively get brighter for thirty minutes before your alarm is set to go off. In this way, smart lights can help to regulate your body's melatonin production and your sleep-wake cycle. The amount of light affects our mood and by using smart color changing light bulbs, you can change the brightness and color according to the weather or season. Make your lights a warmer color during winter months or brighter when it starts to rain. While there hasn't been any scientific studies done on the effects of smart lighting on mood and Seasonal Affective Disorder that we know of, we believe that the approach we outlined will have a positive effect on mood. Most burglaries happen between 10 a.m. and 3 p.m., when homes are empty. With smart lighting, you can program your lights to go off randomly, to make it appear as though someone's home.While you could turn the lights on and off remotely by yourself using a smartphone app, scheduling programs like IFTTT will do it for you everyday once you've created the desired schedule. The benefit of using a scheduling app is that you don't even need access to an Internet connection. There are a couple of ways that smart lighting can help to save you money. Some smart lights have motion sensors, so that you can set your lights to turn on only when someone walks in the room and motion is detected. These type of sensors are especially useful for the hallway or balcony / patio. Another way that smart lighting can save you money is through what's known as daylight harvesting. Light sensors detect how much natural light is available and adjust the brightness of the lights in the room accordingly. By using just the right amount of light every time, there can be some significant savings. 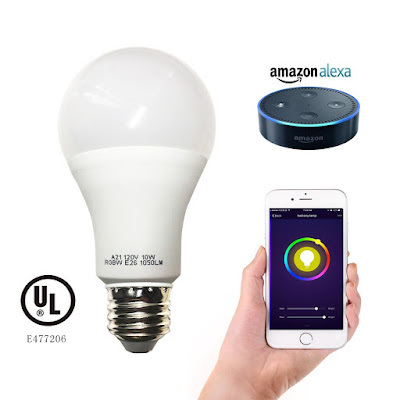 Now that we've looked at why you should consider getting Smart Lights for your home, here are 5 of the best smart light bulbs that are compatible with Amazon's Alexa. 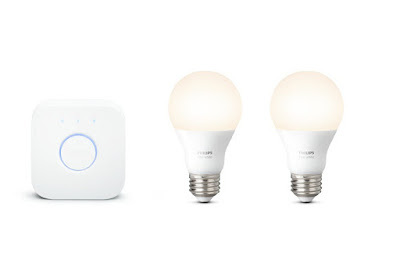 The Philips Hue White A19 60W starter kit features two LED light bulbs and a bridge. You can connect the Philips Hue White with up to 50 lights at a time and through Amazon Alexa, create schedules and change the brightness using your voice. First things first, the Philips Hue White really encapsulates the whole smart home automation experience. Right now, there are two approaches to smart lighting. The first option is to install smart switches, which controls all the bulbs connected to that switch. The other option is to go for smart bulbs, which offer a more individualized approach. To be fair, there are pros and cons to each method, but we shall save that for a future article. For this portion, we shall focus on the Philips Hue's smart bulbs and bridge. location/proximity triggers (If my phone is nearby, turn the lights on. Turn lights off when phone is no longer detected). One of the best things about the app is that there's a master on/off switch that's always listed at the top no matter where in the app you are. That said, the app's user interface is a little clunky with many describing the menus and layers as being not so intuitive. The Alexa integration of the Philips Hue White is terrific and should be a primary consideration when deciding on which smart bulb to get. Using Alexa, you can group your light bulbs, name them and give Alexa voice commands for those groups. For example, "Alexa, dim the bedroom lights to 25%". This really feels like we're living in The Jetsons future. If there is a downside to these smart light bulbs, it is that because the bulbs are controlled by an app that resides on a phone, if you don't have the necessary secondary controls in place, then people just avoid using the lights completely. Or even worse, they end up flipping the switch twice as much. One way around this of course, is to get the whole she-bang - programmable switches, motion detectors etc. But be warned, this does not come cheap. Unlike the Philips Hue White light bulbs, the LIFX Smart LED light bulbs are multi-color allowing you to set the mood of your room from a warm yellow to a cool blue and anything in between. It is also surprisingly compact given the brightness rating and all the features, making it compatible with a lot of lamp fixtures. The LIFX smart LED Light Bulbs can only work on the 2.4 GHz Wi-Fi band which isn't much of an issue in our opinion, given how most modern routers provide for both 2.4 GHz and 5 GHz bands. The 2.4 GHz band also has a longer range which is useful for lightbulbs. 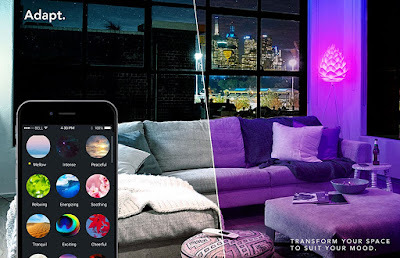 Users have commented that the initial set-up process can be a little convoluted but in general, it involves the app connecting to your home network, after which you will need to create a LIFX account if you're opening the app for the first time. This is then followed by a firmware update on the bulbs. Through the app, you can control both the hue and the brightness of the lamp - from a warm yellow to a cool light blue, you can choose the color that's just right for you. There are also some cool effects to play around with like the candle flicker or strobe. What's missing from the app though is the fact that there isn't any scheduling ability, at least at the time of writing. It would definitely be a nice to have in future app updates. Integrating the LIFX Smart Bulbs requires enabling two separate skills in order to take advantage of all its features. 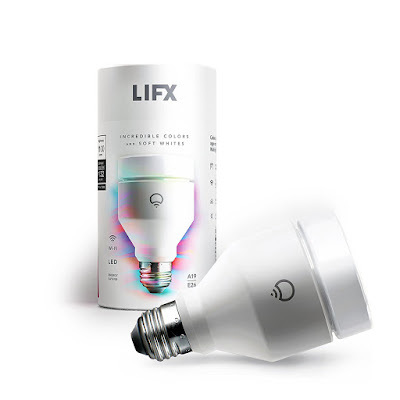 The first is "LIFX Optimized for Smart Home", followed by "LIFX". So what's good about these LIFX light bulbs? For one, they are very compact in size for a dimmable color light bulb. There color range is fantastic and the temperatures can be adjusted to suit your preference. Setting up voice control is pretty straightforward and it is also compatible with other smart home systems like Nest, Google Assistant and SmartThings. All in all, the LIFX Smart LED Bulb is an excellent choice for your smart home. The updated Android and iOS app is a lot more user-friendly and recent firmware updates have made the lights more stable. To be fair, they aren't the cheapest option but for a mid-range price, you're getting a lot of quality. The TP-Link LB100 Smart LED Light Bulb is one of the more affordable options when it comes to smart bulbs. Another big plus for these bulbs is the fact that you don't need a hub, like you do with the Philips Hue. Each individual bulb works with both the Amazon Echo and the app. Setting up the TP-Link LB100 smart light bulbs is easy. All yo need to do is download and register on the app. After which, plug in your light bulbs, wait for the app to detect them, and then register the bulbs on the app. The light bulbs can be grouped, allowing you to issue commands like "Alexa, turn off the living room lights." Choose between the bright white light or a softer yellow, with the standard TP-Link smart light bulb. The basic bulb doesn't come with multiple colors. There is a multi-color option, the LB130, which is admittedly more pricey. 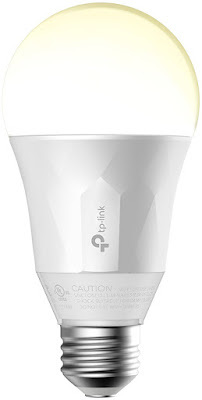 Overall, the big selling points of the TP-Link Smart LED light bulbs are it's price and the fact that it is so easy to set up, without a hub. The MagicLight Smart LED Light Bulb is another affordable smart bulb upgrade if you're looking to get into home automation. There is no need for controllers or hubs, making the setup and use of these bulbs a lot easier as well. The MagicLight is about the size of a normal incandescent bulb which makes it compatible with most lighting fixtures. It's important to note that these light bulbs only work via Bluetooth and not over Wi-Fi. The disadvantage of Bluetooth is that it works over a shorter range and you will need to have a Bluetooth enabled device. On the plus side, it is more stable and Wi-Fi connectivity issues will be a thing of the past. Setting up the bulb is relatively straightforward. Simply screw the bulb in, download the app and register. After which, the app will search for the smart bulb within range via Bluetooth. Your new light bulb is now connected. 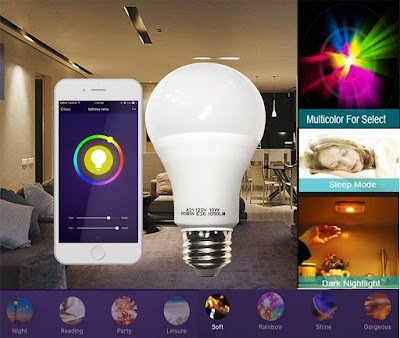 Through the app, you can group your light bulbs, select the color of your bulb, the brightness of the bulb and even effects like candle flicker and strobe. While the effects are cool, users have commented that the app isn't the most elegant. Then again, this could probably be said for most of the smart light bulb apps. 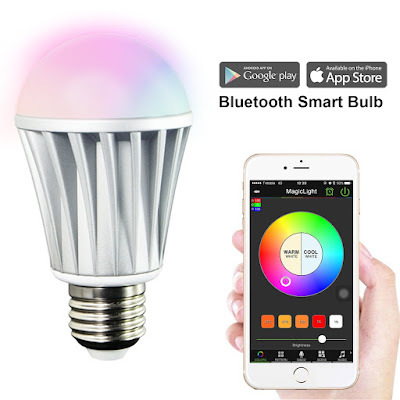 Overall, the MagicLight Bluetooth Light Bulb is really good for adding a splash of color to your room and improving the mood. That said, the 7W version has many comments that it is no where near bright enough. If you want to improve both the mood and the brightness of the room at the same time, the 10W option would be better. The Smart A21 RGBW White and Color LED light bulb is a popular light bulb that, as the name suggests, does both white and color. They don't require a hub and setting them up is very similar to both the TP-Link and MagicLight bulbs. Using the Smart A21 RGBW light bulbs, you can group the bulbs, set schedules, timers and scenes. One of the most useful features is the "Away Mode", which turns the lights on and off at random times, to give the appearance that someone is at home. Users have commented that these bulbs are very bright so if you're looking for something that really brightens up the room, then this could be a good fit for you. Price-wise, they're also on the more affordable end of the spectrum when it comes to smart color changing light bulbs. According to CNBC, 80 million smart home devices were delivered in 2016 alone and that number is poised to rise in 2017 as Home Automation providers merge, consolidate and provide more umbrella services. 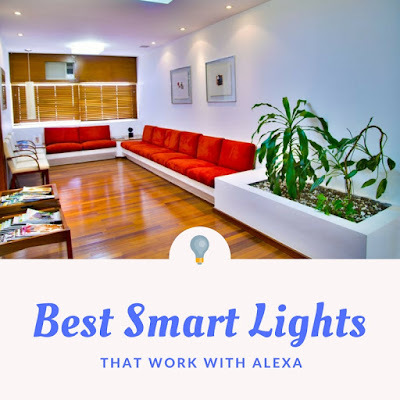 Smart lights epitomize the whole Home Automation experience and you can't go too wrong with any of the five picks above. Again, all of them work with Amazon's Alexa and some are also compatible with other platforms like Google Assistant and Nest. Thank you for reading our guide on the best smart light bulbs that work with Amazon Alexa. In full disclosure, there are affiliate links in the article above and i want to thank you for supporting us these past couple of years. They've gotten us through and we hope to bring you more useful reviews in the future.